Naruto prides himself in front of the masked men after finding out more about tailed beast names. Seing Naruto grown that much, Kakashi and Guy fell very happy. Even the masked man has strange feeling about that, he begin to sweat againts Naruto. He is trying to calm himself by looking down on Naruto. 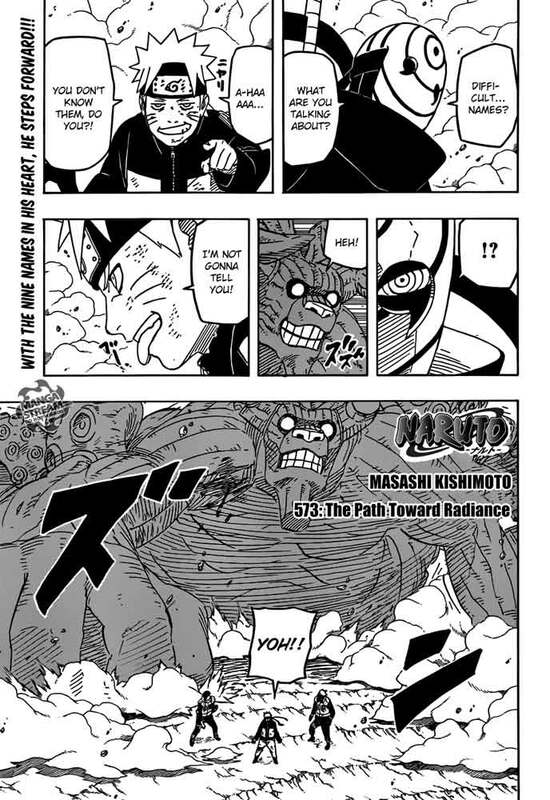 While on HQ base, they can also feel the power of the nine-tails and knowing that Naruto, Bee, Kakashi and Guy are pushing the masked man back. Shikaku Nara ordered inoichi to convey the news of Naruto's group to all of the reinforcements. He want to use that news to up everyone's morale all at once. And finally the news about Naruto's group condition has been spreading to all of the reinforcement point. Everyone's powerful feelings coming together to foretell their victory. Hinata, Kiba, Shino, Shikamaru, Choujim, Ino, Tenten, Lee, Sai, Sakura and the others charge forward and respond to the heroic efforts of Naruto. They are going to all fight together this time. 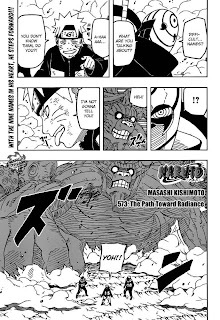 But the most suprising thing is Sasuke is about to come to the battlefield.